Did you know that kiwi, also known as Chinese gooseberry, is China’s national fruit? Underneath the fuzzy skin, the bright green flesh of the kiwifruit speckled with tiny black seeds adds a dramatic tropical flair to any fruit salad and is chock full of vitamin C.
Consider the unloved rutabaga. It’s a cross between a turnip and a cabbage, two other frequently skipped-over veggies. 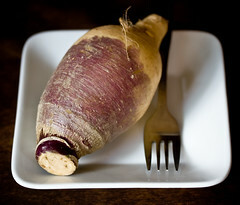 If Frumpy and Unloveable had a root vegetable baby, it’d be a rutabaga.I propose we call them what nearly every other country calls them: swedes. Swedes can be used a slew of different ways. They’re nice boiled and mashed, like potatoes. A popular dish, called rotmos, is a mix of mashed rutabagas, potatoes and carrots, seasoned with butter and salt. You can roast them, fry them, saute them, or eat them raw. They’re generally sweet with a mild turnip like flavor, and they smell like fresh cabbage. I think they’re quite delightful. Rutabagas are often thought of as yellow turnips but actually bear the botanical name Brassica napus and belong to the highly prized family of cruciferous vegetables. The rutabaga, a relatively newcomer in the world of vegetables, is thought to have evolved from a cross between a wild cabbage and a turnip. The earliest records of rutabaga’s existence are from the seventeenth century in Southern Europe. Because rutabagas thrive best in colder climates, they became popular in Scandinavia, but especially in Sweden, the country that earned them the name “swedes.” In Europe, rutabagas are still called swedes. In America, rutabagas were first cultivated in the northern parts of the country in the early 1800s. Canada and the northern states are today’s greatest producers of the rutabaga. Although this beta carotene-rich vegetable has been grown and marketed in our country for nearly 200 years, it remains an uncommon food in American dining. It’s actually a great tasting vegetable with a delicate sweetness and flavor that hints of the light freshness of cabbage and turnip. With its easy preparation and versatility, great nutrition, and excellent flavor, the rutabaga can easily become an endearing family favorite. Because rutabagas store so well, up to one month in the refrigerator and up to four months in commercial storage at 32 degrees, they are available year round. RAW: First, peel them with a vegetable peeler. Slice and enjoy as a snack. Chop, dice, or grate them and add to salads. Create a unique salad with diced rutabagas and other vegetables of your choice. Grate them and add to cole slaw. Grate and combine with carrot salad. COOKED: Rutabagas can be roasted, boiled, steamed, stir-fried, mashed, or stewed. Cook them with potatoes and mash together. Quarter them and roast along with potatoes. Enhance the flavor of stews with chopped or quartered rutabagas. Dice them and add to soups. Stir-fry with onions. Today’s busy lifestyle often makes us seek out healthy recipes that fall into that easy-to-prepare category. Here’s a rutabaga winner. Peel rutabagas with a vegetable peeler, and cut into chunks. Put them into a 4-quart (4 liter) saucepan, add the salt and about 2″ (5 cm) of water to cover. Cover saucepan, and bring to a boil over high heat. Turn heat down to medium and cook about 12 – 15 minutes, or until fork tender. Drain, reserving cooking liquid. Using a potato masher, coarsely mash rutabagas in the saucepan, adding cooking liquid as needed for moisture. Add olive oil and nutmeg. Season to taste with salt and pepper. Transfer to a serving bowl, sprinkle with a dash of nutmeg, and garnish with a sprig of fresh sage or herb of your choice. Serves 6. *With Onions in Broth: Steam or boil rutabaga or turnips to just barely tender. Cool and slice. Saute sliced onions (1/2 cup per pound of roots)(or leeks, or green garlic, or…) In 1 T butter until wilted. Lightly sprinkle onions with flour, cook together for 2 minutes, remove from heat, and stir in beef or chicken broth (1/4 cup per pound of rutabaga/turnips), return to heat, season, and fold in drained roots. Cook together until just tender. Add more broth if needed. For each large rutabaga: peel and cut into 3/4 inch pieces (approx.). Melt 3 T butter with 3 T honey in a medium saucepan or microwave in a med/large bowl, (can use a very light oil such as safflower if you’re either vegan or just trying to live without butter). Toss the turnips with the butter/honey in the same pan, then arrange in one layer in a large jelly roll pan and bake in the oven (400 degrees) for 15 minutes, then stir with along wooden spoon, and continue baking until golden brown and looking yummy and ready to eat. (remember: this is just my method, you can adapt this in any way that makes sense for you.